Cart / Stand dimensions: 38" L x 41" W x 40" H.
Extremely well designed. Works like a champ. This is a true pizza oven that requires pretty much constant attention and "spinning" of the pizza in the oven during the short cooking process. Also, there is an art to topping off the hopper with the fuel pellets to sustain and manage the temperature. Love this kind of real fire analog cooking. I always wanted to build a brick pizza oven for my backyard. 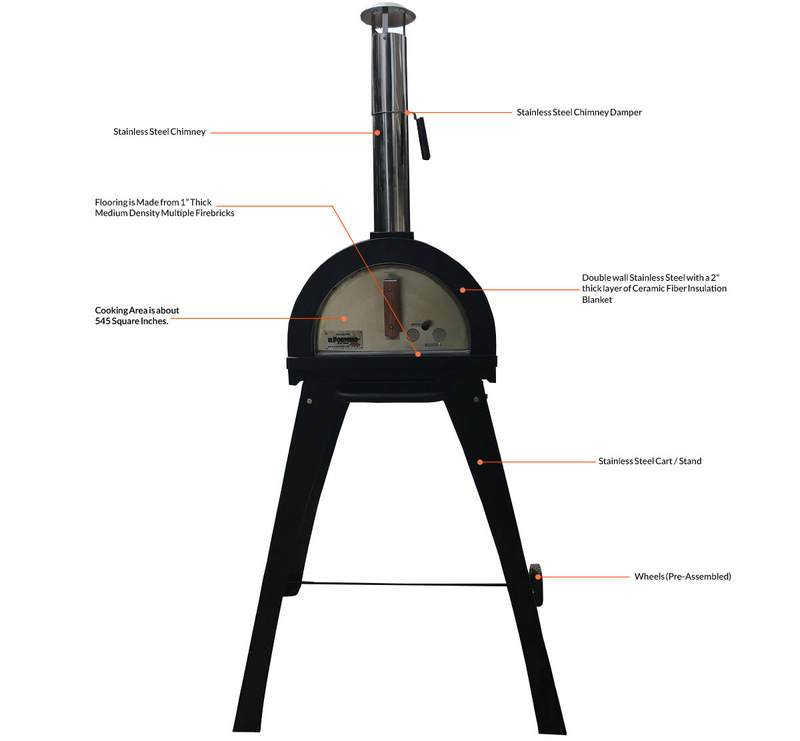 But one of my friend recommend me to buy IlFornino Piccolino Wood Fired Pizza Oven rather than building brick oven. I am very happy with the results of this oven. For the price, portability, and ease of use, you can't beat this oven. Easy to assemble. Would be nice to get a small recipe booklet and suggestions on heating it and suggested temperatures. Highly recommend it. Great price, fast delivery, and services. The crust turns out fantastic. Easy to get set up. Love it!!!! This unit was easy to assemble and worked right out of the box. In just few minutes temperature get over 700 degrees Fahrenheit. My first and only pizza oven (I just bought this) turned out perfect. I like the portability of this unit the best. I can see myself taking this oven camping or to a friend’s house for a small outdoor party. I am from Italy and been pizza for over 2 decades always looking for ways to improve. I did reach my best options at home when making pizza on the Big Green Egg unfortunately because of the heat it generates from below after 2 pizzas the next one will usually burn and stick to the baking stone, very frustrating. I gave it a try to the Fornino Piccolino, I needed something that i can turn on as fast as a charcoal grill and be ready to cook in 30 minutes. I received the Fornino in Monday June 5th and same night i cooked 4 pizzas and they came out wonderful. My wife was surprised since i was cooking them in 2 minutes or less... I have to say that i am very pleased with the outcome. I would recommend it to anyone that wants to use it for family cooking it is perfect, compact and easy to use.